The gender flip in this revival of Sondheim’s Company, produced by the National Theatre, has received plenty of attention. Rather than telling the tale of perennial bachelor Bobbie, actress Rosalie Craig turns the same character into a likeable single gal whose friends relentlessly try to set her up. There are other switches too, not least of all the introduction of a gay couple, plus a brand new song from Sondheim to allow the lead role a further moment in the spotlight. It gives this 1970 musical an updated twist, to resonate even more with a modern audience. Equally, though, it sort of makes no difference. The changes to character and script are so seamless that you’d never know the musical wasn’t written this way. It is, after all, not a show defined by gender. 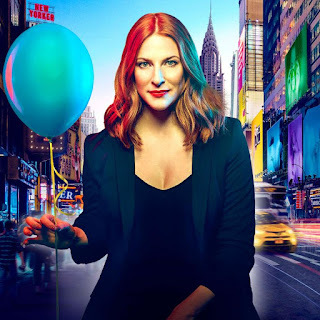 Its themes are universal – a single thirtysomething finding love in New York City, discovering their innate desire for human connection. Man, woman, gay, straight…none of these things really matter, such is the malleability of Sondheim’s work to remain relevant to any and all audiences. The show is, abstractly, a dissection of relationships. 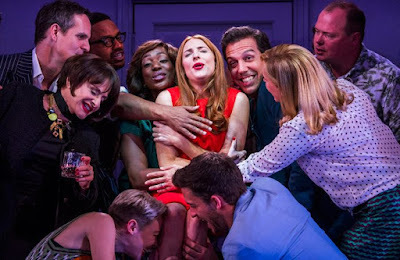 Though it takes place on Bobbie’s 35th birthday (a repeated moment that’s as much about her own age anxiety as it is a structural device), each scene explores the lives of her partnered friends: the overly competitive couple; the couple who need to loosen up; the couple panicking about marriage; the couple more content in divorce. Through Sondheim’s music and George Furth’s book, it’s an incredibly perceptive show that refracts and shifts like a prism. Humans are difficult and oxymoronic, our relationships good and bad. There’s no easy truth, no fairytale ending. All we’re after is…some company. And who said Sondheim doesn’t write tunes? Company is full of them! There are long and searching melodies, jittery and nervous melodies, incessant hooks that niggle away in our minds as much as Bobbie’s. There’s the cutesy “You Could Drive a Person Crazy”, now turned into a barbershop trio, the intricately choreographed “Side by Side”, and of course the soaring “Being Alive” – Craig closing the show in absolutely stunning fashion. The performances throughout are exquisitely sung, each crescendo and lush harmony sending tingles up the spine. And even though the characterisation is sometimes cartoonish, the quirks and emotions of each character are imminently relatable. Bunny Christie’s sleek design frames each scene literally with moveable sets, each bordered in neon themed colours. They’re like comic book panels, vignettes, windows into the lives of these people. It’s a minimalist design that nonetheless parallels the nuances of the show, morphing from intimate bedrooms to the hustle and bustle of the big city and the hundreds of potential connections to be made. This is a polished production that feels effortless, the star cast – from Craig, to Patti Lupone and Mel Giedroyc - all living up to their billing. Special mention to Jonathan Bailey though whose comedic performance as Jamie is scatty and adorable. What’s most apparent, though, is Sondheim’s ability to pick apart the surface of each character and reveal the personal neuroses of each. It turns these characters into real people, a reflection not only of messy humanity but of love itself. Company is sad and frightening and hilarious and reminds us of the sheer joy of being alive. Watch: Company runs at the Gielgud Theatre until 30th March.